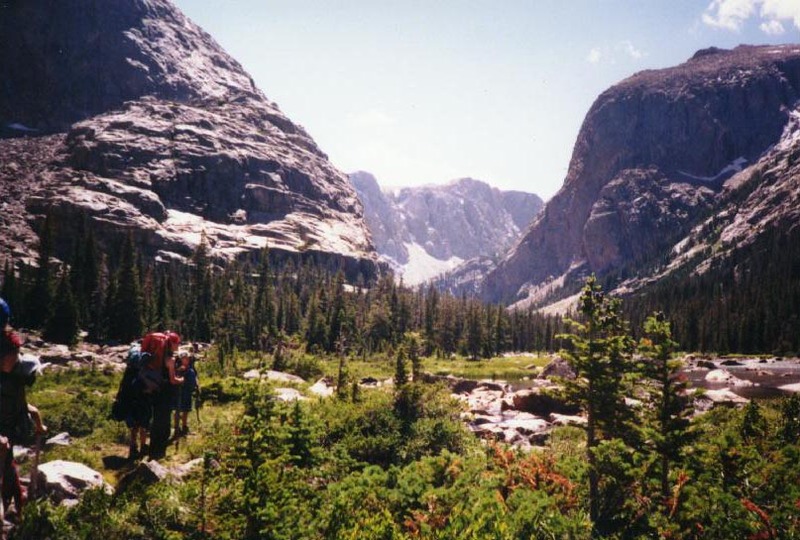 This is one of my all time favorite backpacking trips. Depending on how fast you hike, and how much time you take for fishing and relaxing, you could do it in 3-5 nights. You could possibly do this trip faster, but it wouldn't be nearly as much fun. This hike takes you through very diverse terrain. You start in high desert, move through lush, wet forests, High mountain lakes, beautiful Granite cirques. There is a little bit of route finding necessary between Bomber Lake and Upper Ross Lake, but it is not too hard. There is water along the entire trip. Good campsites the whole way. About 5 miles south of Dubois on route 287/26, take the turn off, west to Torrey Lake/Trail lake. Follow this road past torrey lake, ring lake, and trail lake until the road ends at a trail head parking area. From the parking area, take the Bomber trail following East Torrey creek toward Bomber Lake. This trail begins in arid, desert country, but soon descends into a green, wet valley. The first part of this trail is frequented by horse packers. The trail pretty much follows East Torrey creek the entire way. At about four miles you come to the turn off that heads up some steep switch-backs to the glacier trail. There are some nice meadows here which make good camp sites. From this point on, the horse packers are less in evidence. Continuing on following parallel to East Torrey Creek, the Bomber trail takes you through some beautiful country. The creek widens and the sides of the valley steepen, forming into soaring granite walls. Sometimes, the trail requires that you hop from rock to rock along the shallow creek. At times the path can get a little hard to follow in this area. The trail eventually begins to rise up toward Bomber Falls. There are some good camp sites here, and bomber falls makes a good side trip. Above the falls is the remains of a WW II B-17 bomber that crashed here. From this point the trail becomes both steeper and fainter, but generally heads South, rising steadily. There are a number of forested and marshy sections where the trail tends to disappear and then reappear again. There is a thickly vegetated area with various small streams running through it, bordered by a huge boulder field. You have the choice of bushwhacking through the vegetation or boulder hopping through the boulder field. There is a trail through this section, but it is faint and both times I've been there I have managed to get lost here. It may be necessary to cross the creek on a fallen log bridge depending on the route chosen. Eventually, the valley begins curving West, while gaining in altitude, and the marsh and undergrowth tend to give way to easier (but steeper) terrain. For this section, you want to stay North of the creek, as the trail parallels the creek, but tends to stay up slope a ways on the North side. Almost to Bomber lake, the trail crosses to the South side of the creek, then immediately heads up the steep slope up to Bomber Lake. Bomber lake is a beautiful place. Lots of established campsites around the lake, with the most heavily used ones on the East side. 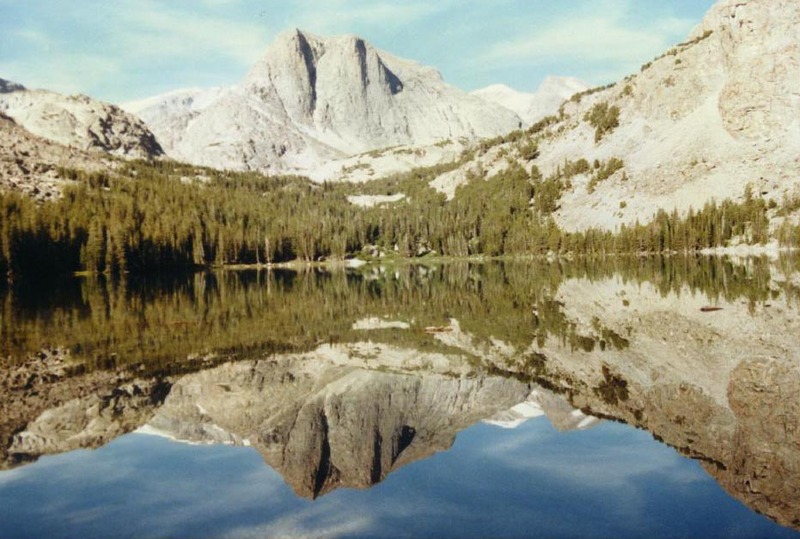 There are beautiful views of Spider Peak, a round topped granite mountain, and other mountain scenery. Skirt Bomber Lake on its South side, then curve West, then North West heading for lake 10359 and Mile Long Lake. The trail here is so faint as to be almost non-existent. Good map and compass skills are very useful in this section, as is a pocket altimeter (or gps). You will need to make several creek crossings, just below lake 10359 and Mile Long Lake. Eventually, after you have forded West Torrey creek just past Mile Long Lake, you curve back East, then North paralleling West Torrey creek until you reach Upper Ross Lake. Upper Ross Lake is a pleasant place with excellent fishing. 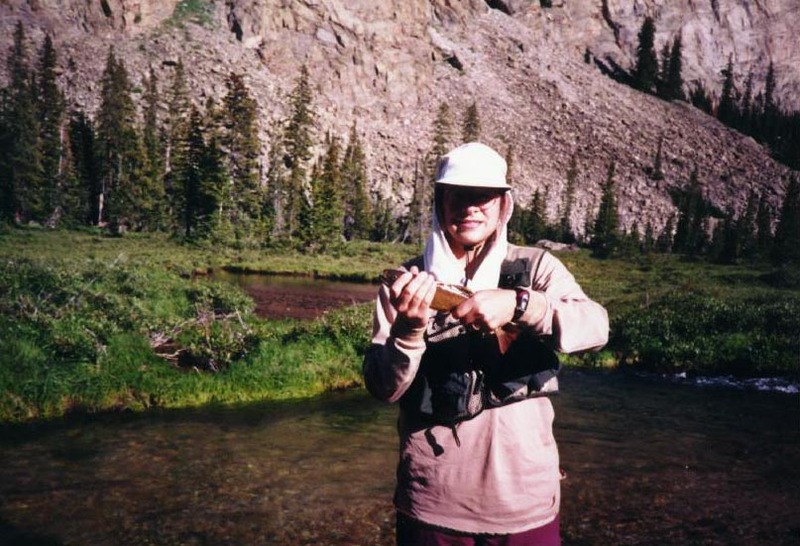 If you like to fish, you will have no trouble finding beautiful brown and cutthroat trout. There are a number of excellent camping spots along the South End of Ross Lake. Follow the trail North along the West side of Upper Ross lake. There are a couple of sections where the trail runs right up against upper Ross lake, and you have to jump across logs and rocks to cross, or maybe wade a bit. The trail eventually leads you to far North end of Upper Ross Lakes, where you cross the creek again on logs, rocks and debris. There are a number of good camp sites here. The trail then continues North, following the East bank of Ross Lake. About two thirds of the way along Ross Lake, you will encounter the only really difficult portion of this hike, a somewhat dangerous stream crossing. Crossing West Torrey Creek where it pours out of Ross Lake and flows down to Hidden Lake is a bit of an adventure. You have to cross on logs over a creek with a very strong current. If you fall off the logs, you could get swept downstream and maybe even over a waterfall. We crossed carfully, with our pack straps undone. A good sense of balance is a definite asset here. It could be serious if you fell in, but there were a bunch of logs to cross on, so the chances of falling were not great. There were also lots of logs and rocks in the water below, so there would be chances to grab hold of stuff even if you did manage to fall in. The crossing was not difficult, but it was a little bit intimidating, however, with the water rushing below your feet. During the spring run-off, the water may be quite a bit higher and more dangerous, I don't know, but I would guess that difficulty is related to how much run-off there is and what time of year you go. Both times I've been hiking here were in late July/ early August. From here, the trail is relatively easy. Follow it North past Ross Lake, then take a fork East and follow it all the way back to the trailhead. Water is not quite as plentiful on this section as on the previous portions of the trail, so carry a little extra here. 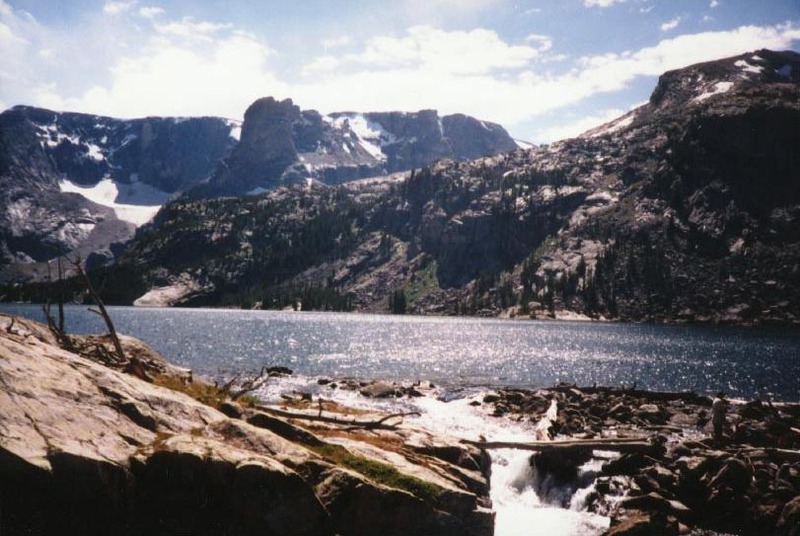 Map: Hiking Map and Guide, Northern Wind River Range, WY Earthwalk Press. Click HERE for an interactive topographical map of the area from Topo Zone. Bring extra mosquito repellant on this hike. It has lots of wet sections that breed lots of nasty, hungry bugs. Another good idea for this hike is a pair of aqua-socks or other wet terrain footwear. There are a number of creek crossings that make these worthwhile, and they make good camp footwear too.